In a whole new world under the sea, in a tale as old as time that brings the circle of life together. This is a snapshot of the Disney universe, basically. 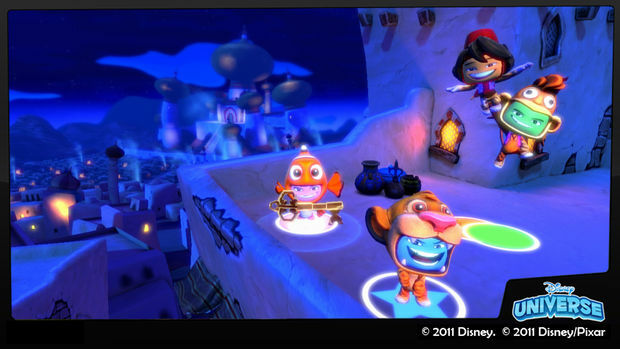 In Disney Universe the game, you get the chance to experience the variety of the many worlds that Disney has created through the eyes of a game developer. It's quite the intriguing story. You're a game developer who is trying to design a Disney themed videogame. You're happily programming away when you are attacked by a computer virus that is slowly ruining your game that you have been working so hard on. The game basically sees you sending antivirus software to combat the virus and do a little quality assurance along the way! In order for the game to recognize your antivirus warriors, they will have to wear a costume from the world of Disney. There are over 42 choices of costumes, like the lovely Ariel (The Little Mermaid). Each costume comes with its own tool and they can be upgraded multiple times through the course of your adventure in order to make you stronger against the virus minions. One thing that I found great in this whole regard are the many different costumes you can wear. You can find yourself taking many hours with each costume trying to get all of their tools set up to the maximum level. You can even share your tools with other players. 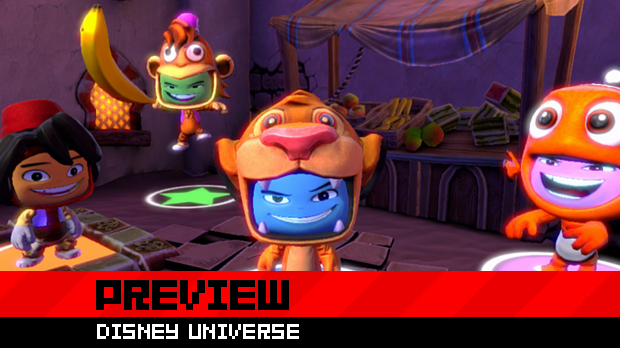 The level design does lend itself to a side-scrolling platformer with many puzzle elements. In one part of the game, we had to find some rather large seeds and plant them. Then we had to find a source of water which helps the plants grow to an instant tree that we were able to use to get to the next area. In the world of Aladdin, we had to find pieces of a scarab and assemble them to create a key that would help us exit the level. The best way to play is through four player co-op mode. It's a real treat for those of you with children or if you just happen to like cutesy games. While you are playing co-op, a flying flashing red cube will appear to help you move along in the level. If you touch the cube, it can do all sorts of fun things like turn you into a basketball and all of a sudden, you have a little game of tag happening where whoever gets touched by the ball, becomes the ball. It's a nice short little diversion. Disney Universe looks like the worlds that we have come to know from Disney. Vibrant, colorful, and full of imagination and wonder. The story is something that feels a little uncommon from what we have seen from Disney, but not doing the same thing over and over is always a welcome idea.